Due to the multitude of different materials present in any car, whether it be a classic, vintage or modern vehicle, there is a very specific environment in which vehicles should be stored to maintain condition. Moisture is the cause of rust and mould and it is this which needs to be managed. At Windrush Car Storage we have spent (and spend) great deal of time researching the different opinions and ‘best practice’ for the storing your pride and joy in the best possible environment. Whilst we may believe this is going to be ‘good’ for your pride and joy, there are several drawbacks. Firstly it’s expensive, how many of our garages are insulated? This means that the heater will be going a lot of time, with a lot of the heat straight out of the roof and walls. Secondly the heat has to come from somewhere. This usually means that the method of doing this has introduced a fire risk, not ideal. Finally, warm air does not necessarily mean dry air. By heating the air the amount of moisture it can hold actually rises. If you brought your vehicle out of the cold into your nice warm garage, condensation would immediately form on all of the surfaces (similar to taking a milk bottle out of the fridge and into the warmer air of your kitchen). Further information on this topic can be found by clicking here. For air to form condensation it needs to be still. (On a windy cold night you’ll never find condensation on your lawn whereas on a cold, still night you will!) By keeping the air moving in your garage it is possible to prevent condensation forming. The downside of this is that the air can still be laden with moisture and wherever the air is allowed to become still (inside the engine bay, exhaust, interior etc) condensation can form starting the rusting or mould process. The next step on from ventilating the whole garage is to place the vehicle inside a purpose built enclosure a little larger than the vehicle where powerful fans draw in air through filters to remove any dust particles and then circulate the air around the vehicle. Several manufacturers supply systems that enclose the car completely in a plastic ‘bubble.’ Advantages are that 99% of dust is filtered out and air is continually being moved by fans to prevent condensation forming. These also have the additional benefit of preventing any objects accidentally coming into contact with the bodywork. The best in our opinion have an internal supporting framework, such as the Airflow AirChamber. The preferred method of removing moisture from the air and regarded as ‘best practice’ in the vehicle storage industry is by dehumidifying the storage environment. Dehumidifying allows vehicles stored in a garage to remain condensation and corrosion free. Units reduce and then maintain the humidity. It is important not to dry the air too much as a relative humidity (RH) drier than 55% may dry any wood (dashboards) or leather too much, causing them to warp and crack. Anything ‘wetter’ than a RH of 55% will allow exposed, untreated metal surfaces to begin the corrosion process. This can include inside the cylinders, brake drums/disks, exhausts and the inside of your cars’ chassis. More advanced dehumidifiers have in-built humidistats to ensure that the air does not become too dry or too wet by turning the machines on and off as required. At Windrush Car Storage we have chosen to dehumidify all our buildings with dehumidifiers which monitor and maintain a target RH of 55%. 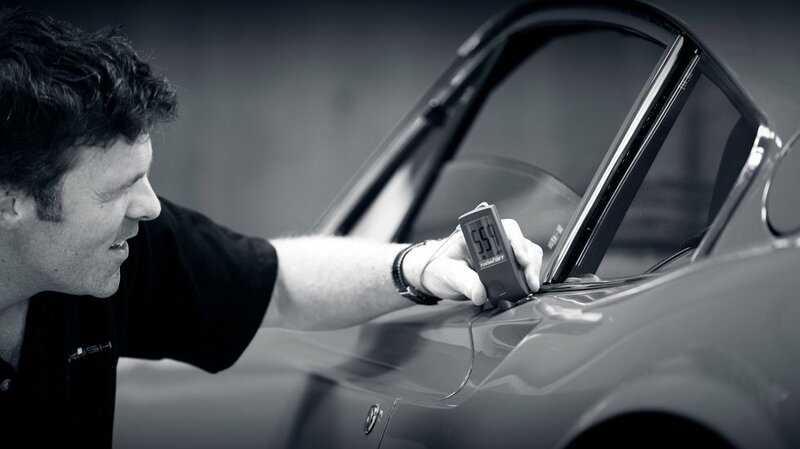 As the ultimate level of protection we then offer to place vehicles inside AirChambers which then offer the ultimate protection for any vehicle in storage by filtering any dust particles out of the air before it enters the AirChamber. From everyday, to prestige and classic car storage, Windrush can provide you with a state-of-the-art, professional and passion driven service for all your car storage needs.